Deep Vein Thrombosis (DVT) affects nearly two million men and women each year, and nearly 300,000 people will die from DVT annually. It is a life-threatening condition that arises when a vein deep in the body is obstructed by a blood clot. DVT is ordinarily found in the leg, usually in the calf muscle, but can appear anywhere in the body. DVT causes potentially fatal complications, and the condition should be taken seriously. DVT takes place when a blood clot forms in a deep vein, typically in the legs. The underlying cause is vein damage, sluggish or slow blood flow, and clotting factors that increase the coagulation of blood. For many people, this condition develops when they are immobilized or sedentary for a long period of time such as sitting at a desk all day, traveling for long hours or being hospitalized. However, deep vein thrombosis causes can range from few to many because it is a multifactorial disease with many risk factors to take note of. Family history. Inheriting a blood-clotting disorder or having a history of DVT/PE increases the risks of developing a DVT. While this alone may not cause blood clots, other combined risk factors should bring cause for concern. Prolonged immobility. When motionless for sustained periods of time, the body’s muscles do not contract to help blood circulate, increasing the risk of blood clotting. This includes extended bed rests, such as from long hospital stays or paralysis, and sitting for lengthy amounts of time, such as on a car or airplane. Trauma or recent surgery. The increased risk is due to the common inability to move for long periods of time after an injury or surgery and changing clotting factors in the blood. While the degree of risk also varies widely along with other factors, without treatment, DVT can occur in as high as 45%-60% of patients undergoing hip and knee surgeries. This can be averted by treatment with sequential compression devices, such as compression stockings, and anticoagulation therapy through the use of blood thinners. Pregnancy. Pregnancy puts strain against the veins in the pelvis and legs as well as causes irregular changes in blood clotting factors. Risk of blood clots can continue for up to 12 weeks following delivery, and if a mother has experienced DVT during pregnancy, recurrent DVT during subsequent pregnancies is not uncommon. Birth control pills (oral contraceptives) or hormone replacement therapy. Estrogen replacement, commonly in oral contraceptives such as birth control and hormone replacement therapy, has been associated with with an increased risk of blood clots. Obesity. Being overweight or obese has been associated with multiple health concerns, including DVT and PE. The risk significantly increases when interacted upon with other environmental or genetic factors. Smoking or secondhand smoke. Smoking has been shown to affect nearly every organ in the body, including the heart and blood vessels, directly affecting blood clotting and circulation. Cancer. Different forms of cancer and/or cancer treatment methods may put patients at increased risks for developing blood clots by affecting substances in blood. Heart failure. Limited heart and lung function increases the risk of DVT and PE and can exacerbate symptoms both. Chronic inflammatory disease. Inflammatory bowel disease (IBD) patients may see a threefold increased risk of thromboembolic events, and patients with Crohn’s disease or ulcerative colitis may even be at risk for experiencing thromboembolic events at a younger age than usual. Those experiencing lupus should also seek proper medical attention as a precaution for DVT. Age (60 or above). Though DVT can occur at any age, the risk increases for those with age greater than 60. This is associated with a general increase in number of risk factors such as cancer, limited heart function, changes in the blood’s tendency to clot, physical changes in veins; and an overall decrease in mobility. Non-O blood group. Having a Non-O may pose as an increased risk in developing VDT when combined with other risk factors. Unfortunately, deep vein thrombosis can take place for months or even years with absolutely no side effects. During the acute stage, a pulmonary embolism may occur causing chest pain and maybe even death. sprained a muscle in their leg. Any patients that notice unusual leg swelling or discomfort for an extended period of time should seek out immediate medical attention. 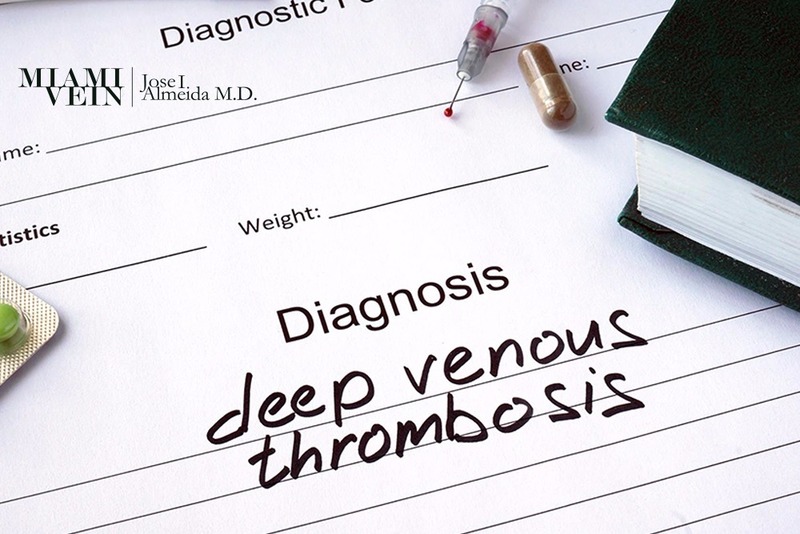 Acute deep vein thrombosis carries the risk of migrating to the lungs (pulmonary embolism), so the mainstay of treatment is anticoagulation (blood thinners). In some cases where acute DVT occurs in the major veins (iliac veins, vena cava) a treatment called catheter-directed thrombolysis (clot busters) may be used to reopen them and re-establish blood flow. If it is determined that the clot is superficial, then most patients will only need minor treatments such as compression stockings, warm compresses for their legs, and anti-inflammatory medication. DVT’s can be diagnosed through history and physical examination, Venous Ultrasound, Computed Tomography Venography (CTV) and Magnetic Resonance Venography (MRV). Make sure that the vascular center and vascular surgeon that treat you are both accredited by the Intersocietal Commission for the Accreditation of Vascular Laboratories (ICA-VL) and the American Board of Medical Specialty, respectively. If you suspect you might have DVT, schedule an appointment today with Miami Vein Center. You will receive the appropriate diagnostic exams and treatment options.